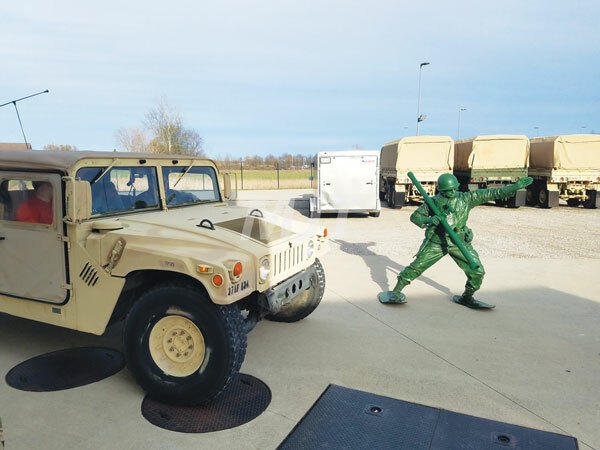 Mark Abbati, as Green Army Guy, directs a Humvee Friday night as part of a “Star-Spangled Military Salute” at The Ohio Army National Guard Armory. The event was organized to honor veterans and active duty men and women. It also served as a fundraiser for the Military Readiness Group, which supports soldiers and their families during deployments for Marysville’s new National Guard Unit — Ohio Army National Guard, Battery C, 1st Battalion, 134th Field Artillery Regiment.